mannu thirumazhisai etc. – In this pAsuram he (maNavALa mAmunigaL) is divining that these are the places of incarnation of thirumazhisaip pirAn, and of thirukkurugUr kArimARan that is, nammAzhvAr, and of SrIvillipuththUr pattar pirAn, that is, periyAzhvAr. 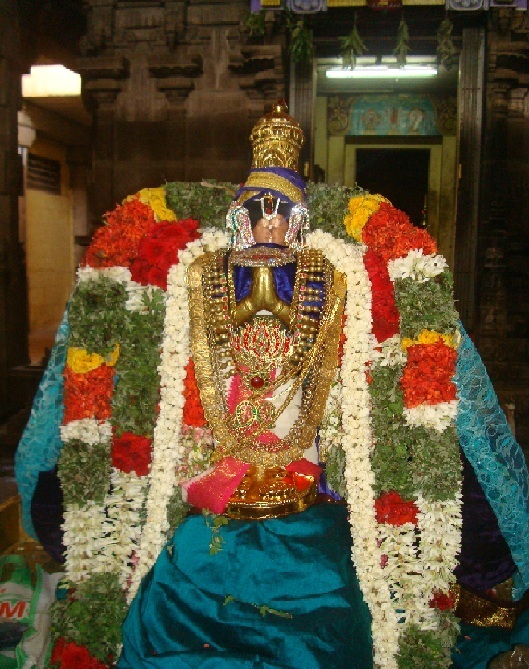 mannu thirumazhisai – (In this pAsuram) as he (maNavALa mAmunigaL) is divining the places of incarnation in the same order as their months of incarnation, even though (in the previous pAsuram) after thirumaNdangudi (of thoNdaradippodi AzhvAr who incarnated in the month of mArgazhi) he had not divined about thirumazhisai (thirumazhisai AzhvAr’s incarnation being next to mArgazhi that is the month of thai) (instead in that previous pAsuram he had divined next at that time about thiruvanjikkaLam of kulasEkara AzhvAr related to mAsi month that comes after thai), but here it is to be noted that the ones given are in a sequence. Or, it can be taken in this way: as he (maNavALa mAmunigaL) had divined earlier as ‘pugazh mazhisai ayyan aruL mARan [upadhESa raththina mAlai – 4]’ (where, after thirumazhisai Azhvar, mARan that is nammAzhvAr was mentioned for the order of incarnation) – for that togetherness also, (here he is mentioning them one after the other). mannu thirumazhisai – This place is having the ever-present relationship of SrI jagannAthar and (thirumazhisai) AzhvAr, and is being mahIsAra kshEthram thus making the earth lighter – such thirumazhisai. 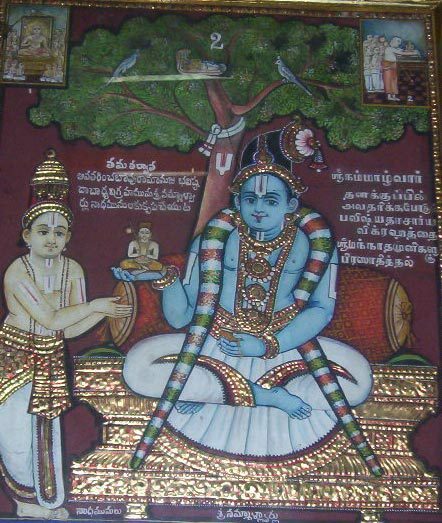 (as when rishis wanted to know a place where they could do their penances etc., and when thirumazhisai was placed in one plate and rest of the places was placed in another plate in the balance, the other places were lighter compared to thirumazhisai, so thirumazhisai was the chosen place for them). This is south of thiruninRavUr, and near to that place. 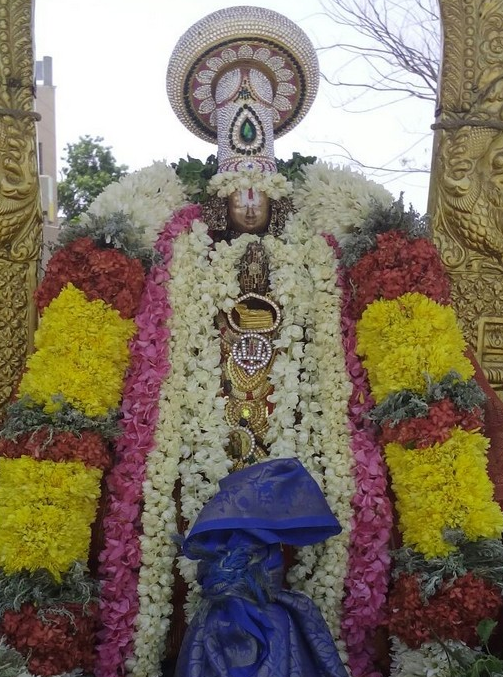 mAdath thirukkurugUr – As said in ‘mAda mALigai sUzhndhu azhagAya thirukkurugUr [thiruvAimozhi 4.4.11]’ (beautiful thirukkurugUr that surrounds us with palatial galleries), having the decorations and setup as a beautiful city of (AzhvAr) thirunagari. nanneRiyOr Eyndha paththi sArar – (followed by those having good ways) – ‘nanneRi’ (good ways) is – AchArya abhimAnam – that is, steadfast in those ways, thirumazhisai AzhvAr is followed lovingly by those like kaNikaNNar and perumpuliyUr adigaL who have surrendered to the AzhvAr who knows the correct path. Or ‘nanneRiyOr’ could also be applied to the mentioned list of AzhvArs. Then it would be (kaNikaNNar, perumpuliyUr adigaL, and) madhurakavi AzhvAr and ANdAL (respectively). It is they who worshiped in fitting ways to the counterpart (AchAryan?) like proper disciples. pattar pirAn – SrI bhatta nAthar – that is periyAzhvAr. These three AzhvArs are such that it is very difficult/rare to get them in this earth, and they incarnated for the protection of the sentient, and this is the detail of the places of their incarnation. These places are in the west, north, and south of SrIrangam which is in the east. This entry was posted in Other, upadhESa raththina mAlai and tagged 74, annan, azhvar, erumbi, erumbiappa, kovil, kurugur, mamunigal, manavala, maran, nammazhvar, pasurams, pattar, periyAzhvAr, piran, rathina, rathinamalai, raththina, raththinamalai, srivilliputhur, thirumalisai, thirumazhisai, thirunagari, upadesa, upadhesa, vagulabaranar, vakulabharanar on January 3, 2016 by raghuram.